As a calendar for the correspondence of a mathematician and professor of Mathematics at the Royal Military Academy enters our union catalogue, it is wonderful to watch the related contacts and networks extend our growing cluster of early modern mathematicians through the second half of the eighteenth century into the beginning of the nineteenth. The son of a colliery overseer, Charles Hutton was born and brought up in Newcastle upon Tyne. Were it not for a childhood injury to one of his arms that led to a permanent disability, most probably he would have followed his forebears and siblings to work in the pit. Fortunately for subsequent mathematicians, however, Hutton was sent to school rather than to work and by his late teens had taken the place of his teacher in Jesmond. 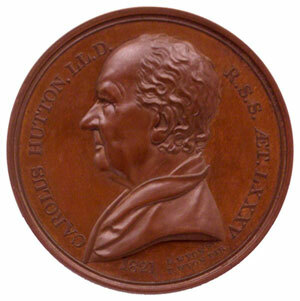 Hutton continued to establish himself and developed a focus on applied mathematics, in particular on navigation and surveying, and in 1779 he was awarded a doctorate at the University of Edinburgh and appointed Foreign Secretary of the Royal Society. Hutton’s correspondence has been collated by Dr Benjamin Wardhaugh as part of his AHRC-funded work on Hutton. It is a rich catalogue, with people mentioned in the letters noted and many insightful abstracts provided. As Dr Wardhaugh remarks, while Hutton might be known best today for the opposition he encountered from Joseph Banks, the then president of the Royal Society, he emerged as the crucial focal point of a network of mathematicians in Georgian Britain. Mathematical correspondence in EMLO is growing rapidly under the invaluable direction of Dr Philip Beeley, and many more early modern mathematicians are on course to join this particular circle in the coming months. For the present, however, we wish Dr Wardhaugh and Dr Beeley well as they embark upon their new and fascinating project, Reading Euclid: Euclid’s Elements of Geometry and its reception in Britain and Ireland, 1570-1700. This entry was posted in Uncategorized on November 30, 2016 by Miranda Lewis. The focus of the most recent catalogue to be published in EMLO — theologian Johannes Coccejus — may be best known for the conflict into which he was drawn by the Utrecht-based theologian Gisbertus Voetius and his followers, but I’d like to highlight today how Coccejus’s afterlife contains an extraordinary episode entirely in keeping with his peace-loving character. Although Coccejus (or Cocceius) was German by birth — he was born and raised in Bremen — he spent most of his adult life in the low countries. An eminent scholar, he become professor of Hebrew and oriental languages at Franeker from 1636, and from 1650 until his death in 1669 was professor of theology at Leiden. 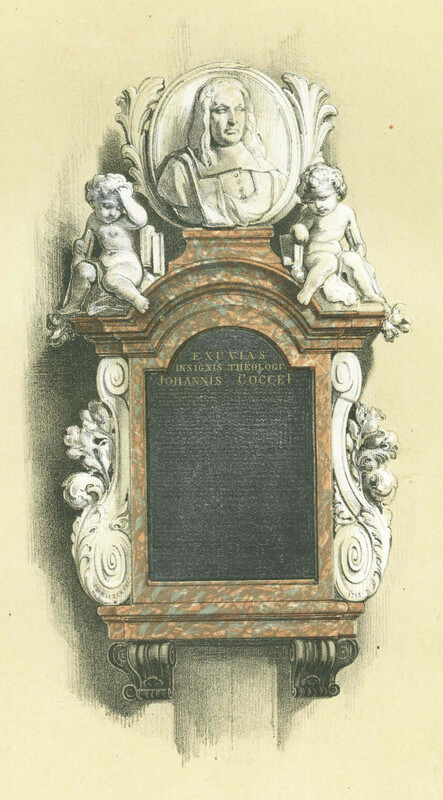 The late Willem van Asselt (who was professor of Reformed Protestantism at the university of Utrecht and professor of historical theology at the Evangelical Theological Faculty in Leuven) portrays Coccejus as: ‘a man of a deep personal faith and piety. His students observed this and one of them wrote: “His hearers noted that his eyes would fill with tears when, in giving an exposition of Scripture, he praised the richness of God’s grace”.’ It seems Coccejus was an unwilling (this noted by van Asselt) combatant in the Voetian dispute, which centred around the interpretation of the Sabbath and the Fourth Commandment, and on interpretations of salvation in the Old and New Testaments. This debate, which arose and took hold in the middle of the seventeenth century in the United Provinces, continued far beyond Dutch national borders and long after the deaths of the major protagonists. Coccejus fell victim to plague in Leiden. 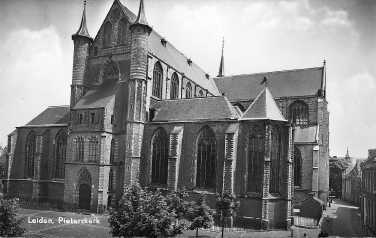 He was buried in the Pieterskerk. And it was here, where the memorial erected to him still stands, that he provided from the grave scholarly refuge and shelter in a way he could never have foreseen. In 1940, as Nazi troops entered the city, the curators of the University of Leiden took the symbolic treasures of the institution — the keys, the seals, and the sceptres — and hid them in Coccejus’s tomb. Even the register of students used in graduation ceremonies was tucked in for safe-keeping with the theologian’s remains. There’s something gloriously apt about Coccejus proving himself — again in van Asselt’s words — a ‘defender of academic freedom and the Reformed tradition’ almost three centuries after his death. The calendar of correspondence you’ll find now in EMLO spans Coccejus’s scholarly life and is based on the metadata of his letters printed in epistolaries that have been collated by Monika Estermann in her invaluable inventory of German correspondence. This is another catalogue we are incorporating into EMLO in the expectation that scholars will find it of use and will be tempted to contribute additional metadata. If you’d like to add to the calendar, please be in touch. This entry was posted in Uncategorized on November 20, 2016 by Miranda Lewis.